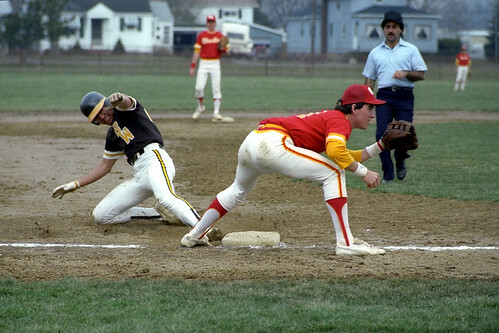 Center fielder Jim Stefanik slides into third base during the Yellow Jackets’ 10–2 win over Oberlin College at the B-W baseball field on April 6, 1983. I’ve added one last batch of photos to the B-W Baseball 1983 photo set at Flickr. They were taken at the B-W baseball field during a 10–2 win over Oberlin College on April 6, 1983, and doubleheader sweeps of the College of Wooster on April 16 and Kenyon College on April 23. The Yellow Jackets finished the ’83 season with an overall record of 18–10 and were third in the Ohio Athletic Conference Northern Division with a 10–4 mark.